The Red Cross is one of the largest independent humanitarian networks in the world and cares for people in crisis in local communities and overseas. Money raised by Oxford2Oxford will directly support the work of the Red Cross. To find out how to donate online please click one of the following links. Marked "Oxford2Oxford pg 6020 location 30200" on the reverse and made payable to Australian Red Cross to GPO Box 9949 in your state capital city in Australia. 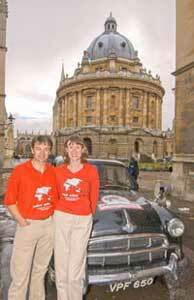 On the 5th May 2004, we, Tim Nicholson and Joanne Bowlt, set off from Oxford, England, to drive to Oxford, New Zealand, in a fifty year old Morris Oxford. Our 1954 classic British car, called Florence, has steered clear of camels in the deserts of North Africa, avoided Elephants and holy cows on the monsoon potholed roads of India, survived Singapore super-efficiency and dodged Australian kamikaze Kangaroos and erratic Emus on route to New Zealand. 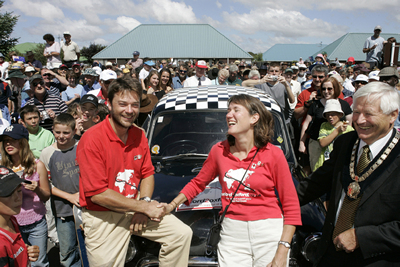 After nine sea crossings and 17,000 miles of driving we arrived in Oxford, New Zealand, on 13th February 2005. We have visited the Red Cross and Red Crescent in each country along our route and, having seen them in action , encourage you to help us raise funds to support their valuable work. All donations directly support the work of the Red Cross at home and overseas as part of the International Red Cross and Red Crescent Movement. Oxford Brookes University in 1994. Tim left his job as a senior executive with Pillar Property Plc. to undertake this adventure. Joanne Bowlt, 35, a PPE graduate from The Queen?s College, Oxford University (1988-1991). Now a Public Relations Consultant, Joanne formerly worked as the Campaign Manager of the successful no campaign. We left our London jobs, let our flats, sold our modern cars and put our belongings into storage in order to undertake this challenge.